An aerial view of the Taj Mahal alias Tejo Mahalaya, ancient Hindu temple complex in Agra. For the last 300 years the world has been fooled to believe that this stupendous edifice was built by the 5th generation Mogul emperor Shahjahan to commemorate one of his dead wives--Mumtaz. The two flanking buildings although identical, only the one in the rear is known as a mosque. The Taj Mahal has seven stories. Five of them lie sealed and barred concealing rich evidence. The marble building in the centre is flanked by two symmetrical ones. The one in the foreground is the eastern one. The one in the background is being represented as a mosque because it is to the west. They should not have been identical if only one was to be a mosque. In the courtyard at the foot of the eastern building is inlaid a full scale replica of the trident pinnacle [found at the top of the dome]. The tiny tower at the left near the western building, encloses a huge octagonal multi-storied well. This is the massive octagonal well with palatial apartments along its seven stories. A royal staircase descends right down to the water level indicated by the tiny white patch showing the sun's reflection. This was the traditional treasury well of the Hindu temple palace. Treasure chests used to be stacked in the lower stories. Accountants, cashiers and treasurers sat in the upper stories. Cheques called handies used to be issued from here. On being besieged, if the building had to be surrendered to the enemy, the treasure used to be pushed into the water for salvage later after recapture. For real research, water should be pumped out of this well to reveal the evidence that lies at the bottom. This well is inside a tower near the so-called mosque to the west of the marble Taj. Had the Taj been a mausoleum this octagonal multistoried well would have been superfluous. A frontal view of the Taj Mahal alias Tejo Mahalaya in Agra. It is octagonal because the Hindus believe in 10 directions. The pinnacle pointing to the heaven and the foundation to the nether world, plus the eight surface directions make the 10 directions. Divinity and royalty are believed to hold sway in all those 10 directions. Hence in Hindu tradition, buildings connected with royalty and divinity must have some octagonal features or the buildings themselves should be octagonal. The two flanking cupolas (two others to the rear are not seen in this photo) are also identical. The towers at the four plinth corners served as watch towers during the day, and to hold lights at night. Hindu wedding altars and Satyanarayan worship altars invariably have such towers at corners. [Many other Hindu temples, such as those at Khajurao, also can be found to have four towers or temples, one at each corner of the temple foundation.] The lotus flower cap on the head of the dome is a Hindu feature. Muslim domes are bald. This marble edifice has four stories. Inside the dome is an 83 ft. high hall. The Taj has a double dome. The dome one sees from inside ends like an inverted pan on the terrace. The dome seen from outside is a cover on the inner dome. Therefore, in between them is an 83 ft. hall. This may be considered as one storey. Underneath may be seen the first storey arches and the ground floor rooms. In the basement, visitors are shown one room. All these constitute the four storeys in the marble edifice. Below the marble structure are two stories in red stone reaching down to the river level. The 7thstorey must be below the river level because every ancient Hindu historic building did have a basement. Thus, the Taj is a seven-storied structure. The dome of the Taj Mahal bearing a trident pinnacle made of a non-rusting eight-metal Hindu alloy. The pinnacle served as a lightning deflector too. This pinnacle has been blindly assumed by many to be an Islamic crescent and star, or a lightning conductor installed by the British. This is a measure of the careless manner in which Indian history has been studied till now. Visually identifiable things like this pinnacle too have been misinterpreted with impunity. 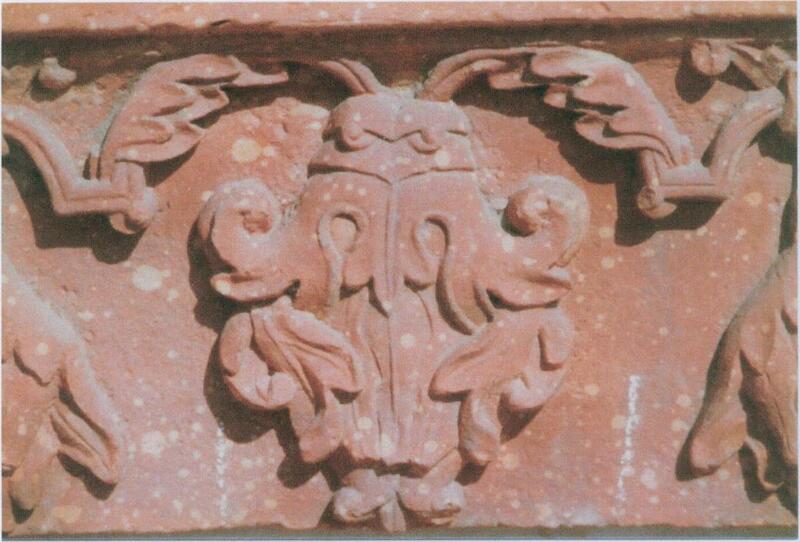 The flower top of the dome, below the pinnacle, is an unmistakable Hindu sign. A full scale figure of this pinnacle is inlaid in the eastern courtyard. A close up of the upper portion of the pinnacle of the Taj Mahal, photographed from the parapet beneath the dome. The Hindu horizontal crescent and the coconut top together look like a trident from the garden level. Islamic crescents are always oblique. Moreover they are almost always complete circles leaving a little opening for a star. This Hindu pinnacle had all these centuries been misinterpreted as an Islamic crescent and star or a lightning conductor installed by the British. The word "Allah" etched here by Shahjahan is absent in the courtyard replica. The coconut, the bent mango leaves under it and the supporting Kalash (water pot) are exclusive Hindu motifs. The full scale figure of the pinnacle on the dome has been inlaid on the red stone courtyard of the Taj Mahal. One may see it to the east at the foot of the riverside arch of the flanking building wrongly dubbed as Jamiat Khana (community hall) by Muslim usurpers. Such floor sketches in courtyards are a common Hindu trait. In Fatehpur Sikri it is the backgammon board which is sketched on a central courtyard. The coconut top and the bent mango leaves underneath, resting on a kalash (i.e. a water pot) is a sacred Hindu motif. Hindu shrines in the Himalayan foothills have identical pinnacles [especially noticed at Kedarnath, a prominent Shiva temple]. The eastern location of the sketch is also typically Hindu. The length measures almost 32 ft. 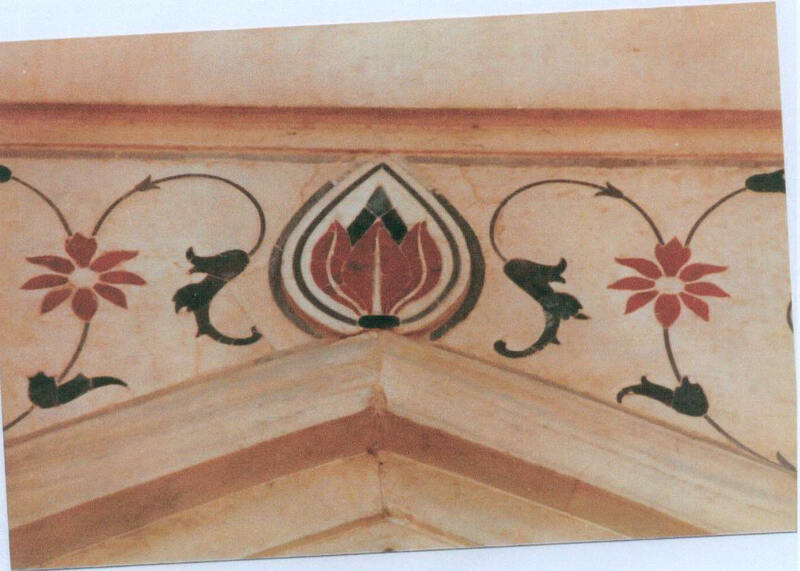 The apex of the lofty entrance arch on all four sides of the Taj Mahal bears this red lotus and white trident--indicating that the building originated as a Hindu temple. 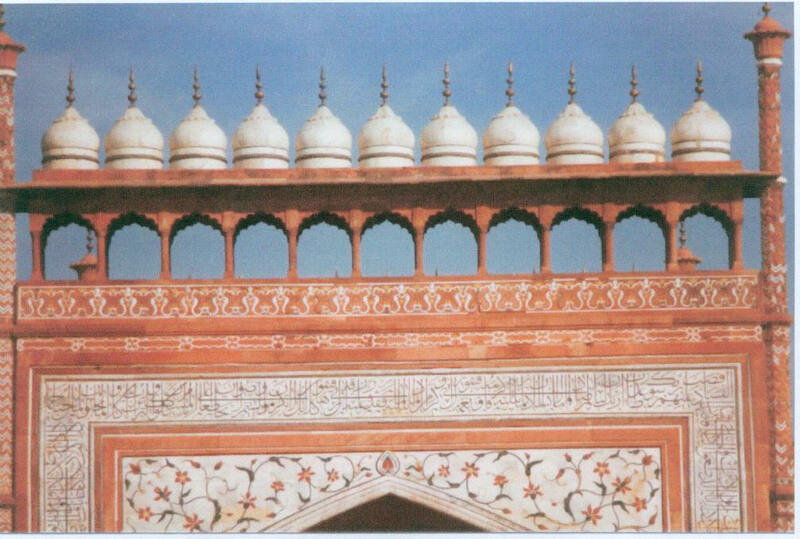 The Koranic lettering forming the middle strip was grafted after Shahjahan seized the building from Jaipur state's Hindu ruler. This is a riverside view of the Taj Mahal. The four storied marble structure above has under it these two stories reaching down to the river level. The 22 rooms shown in other photos are behind that line of arches seen in the middle. Each arch is flanked by Hindu lotus discs in white marble. Just above the ground level is the plinth. 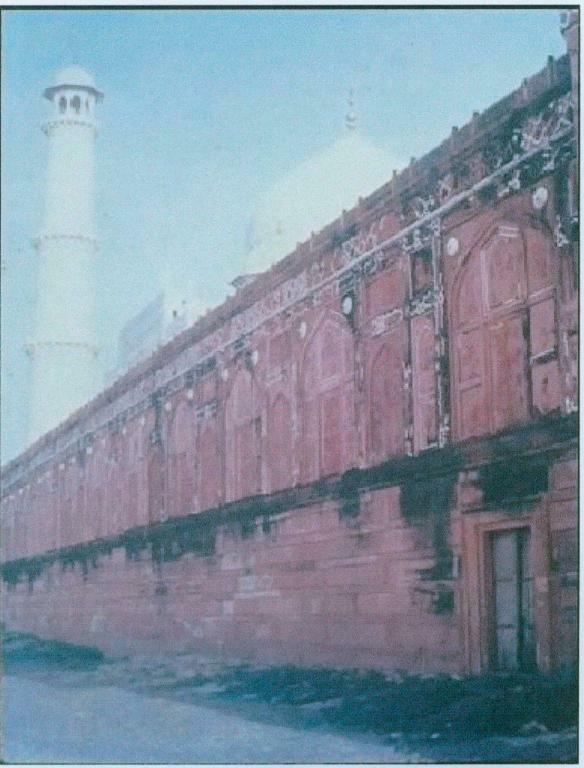 In the left corner of the plinth is a doorway indicating inside the plinth are many rooms sealed by Shahjahan. One could step out to the river bank from the door at the left. 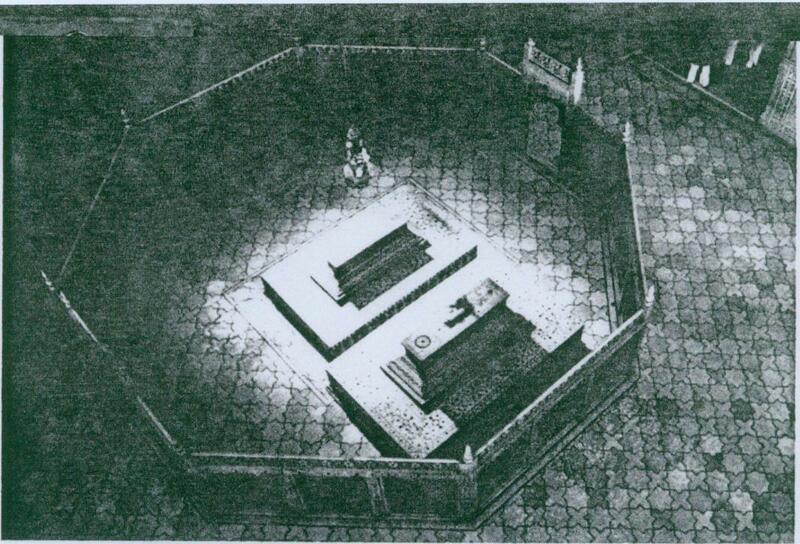 The 7th storey is surmised to be under the plinth below the ground because every ancient Hindu mansion had a basement. Excavation to reach the basement chamber should start under this door. 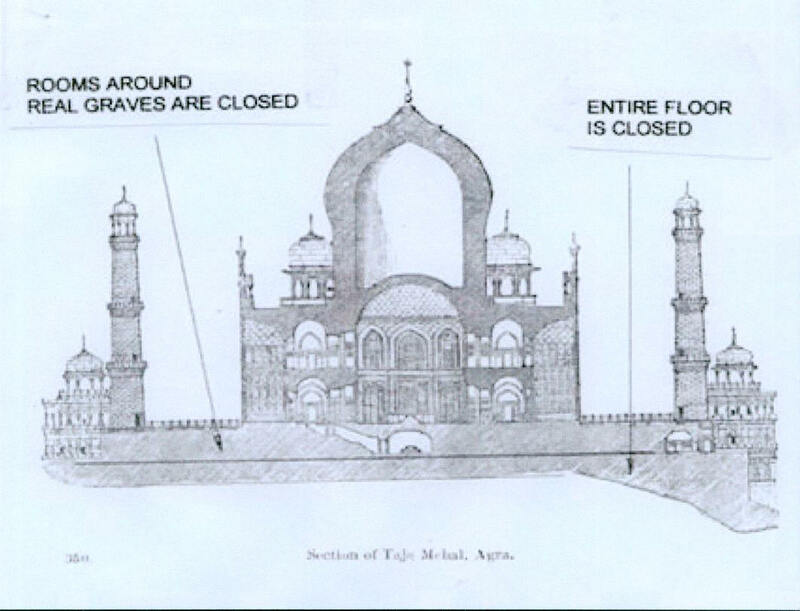 Most people content to see Mumtaz's grave inside the Taj fail to go to the rear riverside. This is the riverside view. From here one may notice that the four-storied marble structure on top has below it two more stories in red stone. Note the window aperture in the arch at the left. That indicates that there are rooms inside. Inside the row of arches in the upper part of the wall are 22 rooms. In addition to the four stories in marble, this one shows red stone arches in the 5th storey. The 6th storey lies in the plinth in the lower portion of the photo. In another photo a doorway would be seen in the left corner of the plinth, indicating the presence of apartments inside, from where one could emerge on the river for a bath. These corridors at the approach of the Taj Mahal are typically Hindu. They may be seen in any ancient Hindu capital. Note the two octagonal tower cupolas at the right and left top. Only Hindus have special names for the eight directions and celestial guards assigned to each. Any octagonal feature in historic buildings should convince the visitor of their Hindu origin. Guards, palanquin bearers and other attendants resided in hundreds of rooms along numerous such corridors when the Taj Mahal was a Hindu temple palace. Thus the Taj was more magnificent and majestic before it was reduced to a sombre Islamic cemetery. This Naqqar Khana alias Music House in the Taj Mahal garden is an incongruity if the Taj Mahal were an Islamic tomb. Close by on the right is the building which Muslims claim to be a mosque. The proximity of a mosque to the Music House is incongruous with Muslim tradition. In India, Muslims have a tradition of pelting stones on Hindu music processions passing over a mosque. Moreover a mausoleum needs silence. A dead person's repose is never to be disturbed. Who would then provide a band house for a dead Mumtaz? Contrarily Hindu temples and palaces have a music house because morning and evening Hindu chores begin to the sweet strains of sacred music. 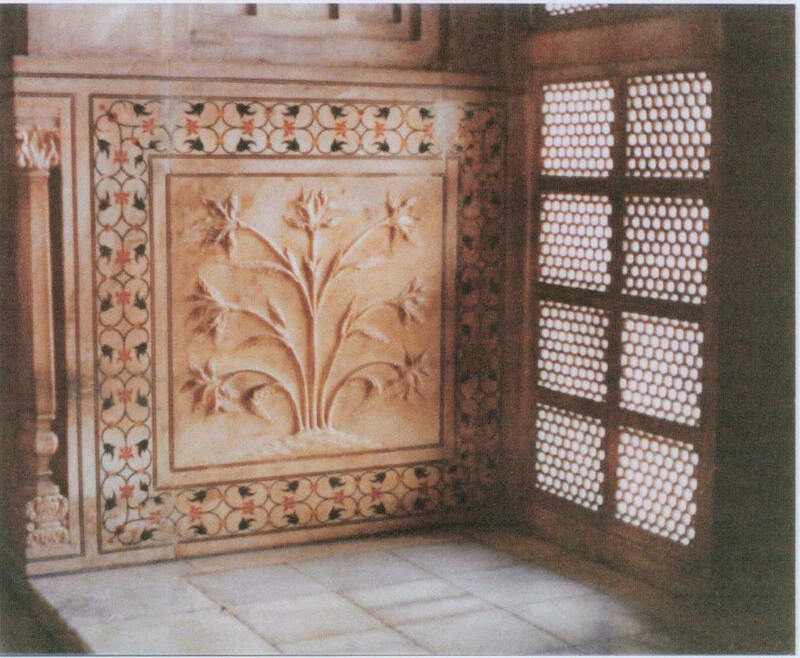 Such are the rooms on the 1st floor of the marble structure of the Taj Mahal. The two staircases leading to this upper floor are kept locked and barred since Shahjahan's time. The floor and the marble walls of such upper floor rooms can be seen in the picture to have been stripped of its marble panels. 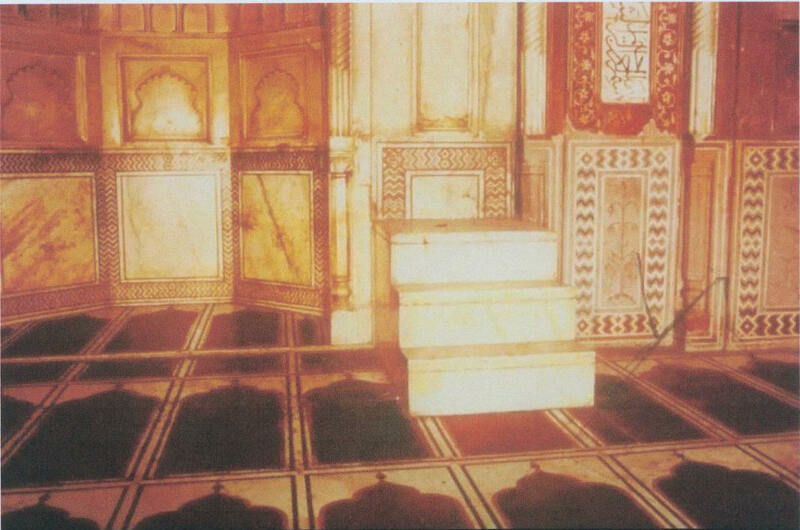 Shahjahan used that uprooted marble from the upper floor for constructing graves and engraving the Koran because he did not know wherefrom to procure marble matching the splendour of the rest of the Taj Mahal. He was also so stingy as not to want to spend much even on converting a robbed Hindu temple into an Islamic mausoleum. This is the Dhatura flower essential for Hindu Shiva worship. The flower is depicted in the shape of the sacred, esoteric Hindu incantation 'OM.' Embossed designs of this blooming 'OM' are drawn over the exterior of the octagonal central sanctorum of Shiva where now a fake grave in Mumtaz's has been planted. While perambulating around the central chamber one may see such 'OM' designs. This staircase and another symmetrical one at the other end lead down to the storey beneath the marble platform. Visitors may go to the back of the marble plinth at the eastern or western end and descend down the staircase because it is open to the sky. But at the foot the archaeology department has set up an iron door which it keeps locked. Yet one may peep inside from the iron gate in the upper part of the door. Shahjahan had sealed even these two staircases. It was the British who opened them. 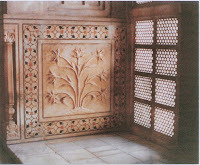 But from Shahjahan's time the stories below and above the marble ground floor have been barred to visitors. We are still following Mogul dictates though long free from Mogul rule. One of the 22 rooms in the secret storey underneath the marble plinth of the Taj Mahal. Many such features of the Taj remain unknown to the public so long as they see it only as a tomb. 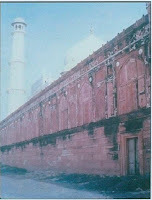 If the public knew how much it is missing in the Taj Mahal it will insist that the government unseal its many stories. 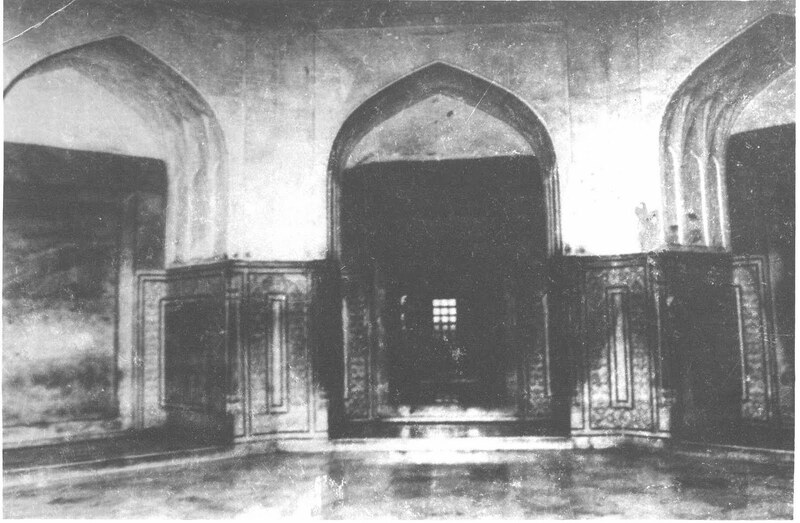 Two doorways at either end of this corridor in the right side wall leading to inner apartments have been sealed by Shahjahan. 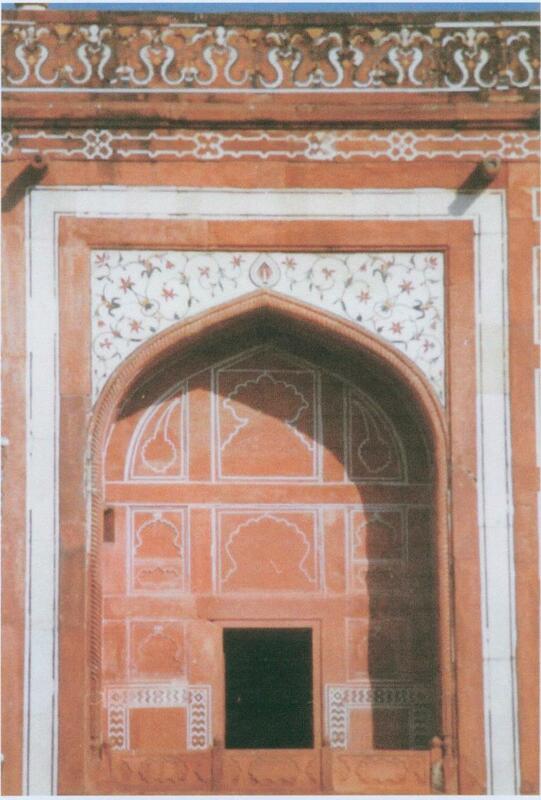 If those doorways are opened, important evidence concealed inside by Shahjahan may come to light. A corner of one of the 22 rooms in the secret storey immediately below the marble platform of the Taj Mahal. Note the strips of Hindu paint on the wall. 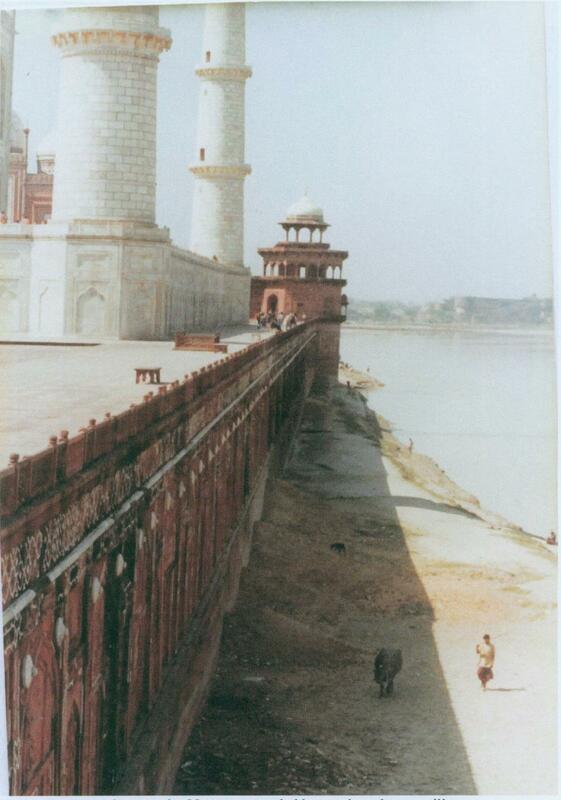 The ventilator at the left, meant for air and light from the riverside, has been crudely walled up by Shahjahan. He did not bother even to plaster them. Had Shahjahan built the Taj as a mausoleum what was the purpose of the 22 rooms? And why are they kept locked and hidden from the public? Burharpur is a very ancient historic city on the Central Railway between Khandwa and Bhusawal junctions. Burhanpur and the nearby Asirgarh (fort) used to provide hospitality to Hindu royals proceeding north or south on pilgrimage, weddings or military expeditions. Barhanpur has many magnificent mansions which are currently being described as mosques and tombs of alien Islamic invaders. This building is one such ancient Hindu royal palace captured by the Moghuls. Mumtaz died here during her 14th delivery around 1630 A.D. while she and Shahjahan were camping here. She is said to be buried in a Hindu pavilion in front of this palace. In a detail on the gate, we can see two elephant’s trunks, one on either side of the design, which would indicate Ganesh. Inverted water-pots on top. Their number is always odd, 11 in this case, typical of the Vedic system. Notice also the cobra design in pairs below the gallery. 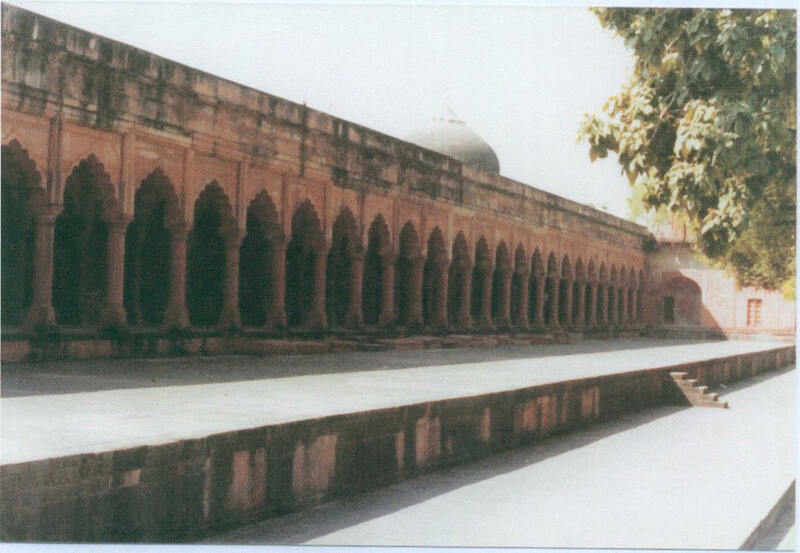 Koranic inscriptions were a graffiti added by Shahjahan. Wall decorations as we see here are typical Rajput style. There is also a balcony at first floor level. Note the Trident within the lotus form at the apex. 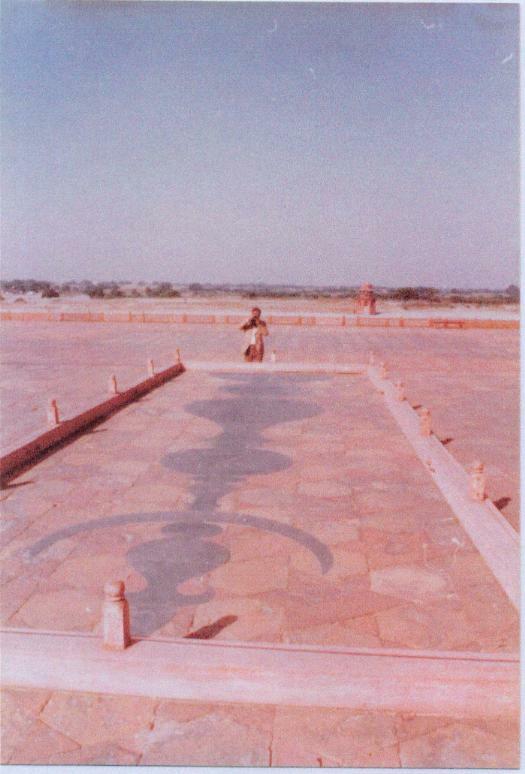 Both of which are Vedic references, the trident being connected with Lord Shiva. The Veranda on the west side of the Entrance Gate. It was probably for public assemblies, discussions, teaching or chanting of Mantras. 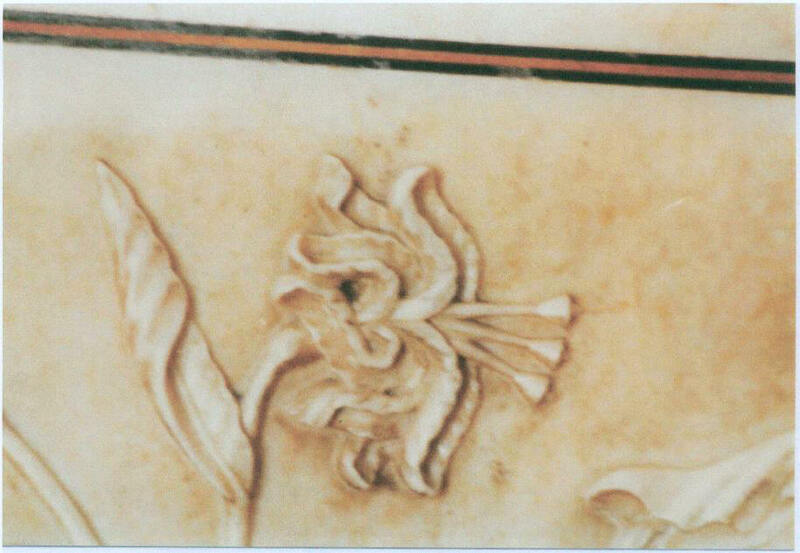 Now you can see the "3" figure of the OM design within the carved marble flower, a definite Vedic design. Conch shell decorations in marble carving next to the ventilation grill. We are now outside the Cenotaph Chamber. Note how the steps in plain marble break up the designs on the plinth wall. This means that they are not original. The Cenotaph chamber with marble screen. The point is why have an octagonal screen around two graves? It is more likely to have been an area of where sacred activities once took place. Replica of the pinnacle design of the top of the main dome as found in the garden. 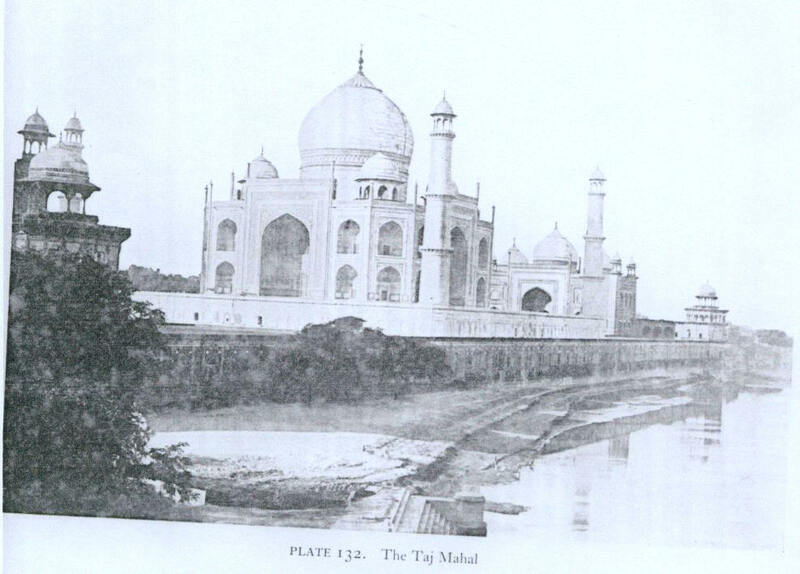 An early photo of Taj from the riverside clearly showing 2 levels of hidden basements. Vincent Smith published this photo in his book "History of Fine Art in India and Ceylon", in 1911. The earliest we find such photo was in 1844 in Sleeman’s book – "Rambles and Recollections of an Indian Official". And yet no historian has ever been curious to go inside these basements. Blue print of the Taj Mahal showing cross-section of Central Edifice in a book by J Fergusson in 1855. It clearly shows the hidden basements. 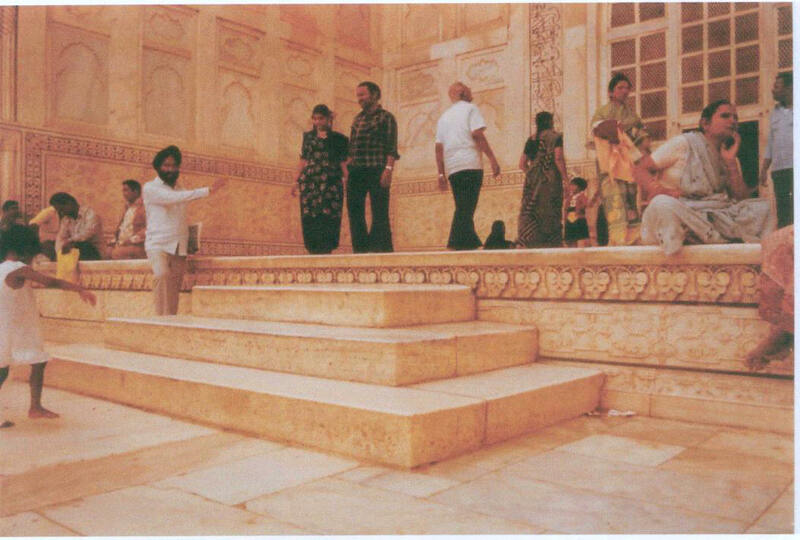 Here you can see, not far from the plinth of the Taj, the stairway that goes down to the 22 rooms. It is surrounded by the red sandstone railing. Entrance to lower basement floor that is now bricked up. The timber door before it was sealed up with bricks. 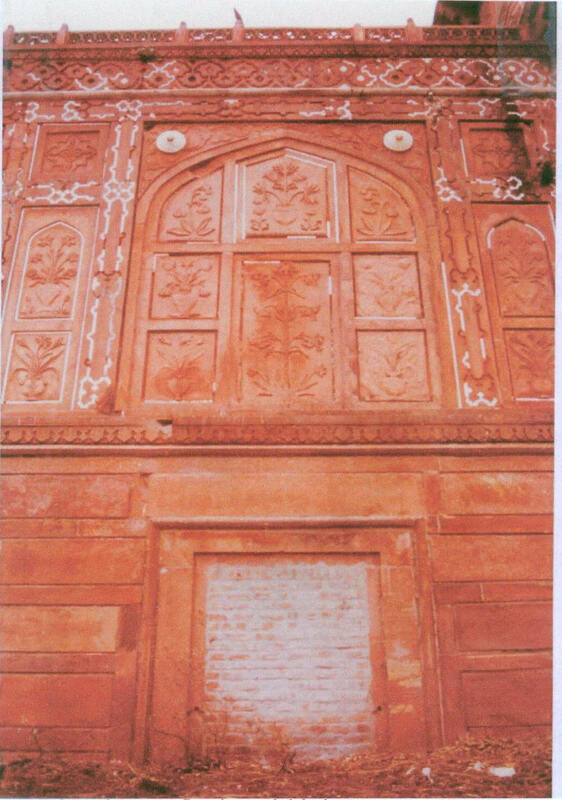 In 1974 American Professor Marvin Mills took a sample from this door for Carbon dating and concluded that the Taj Mahal pre-dates Shahjahan. 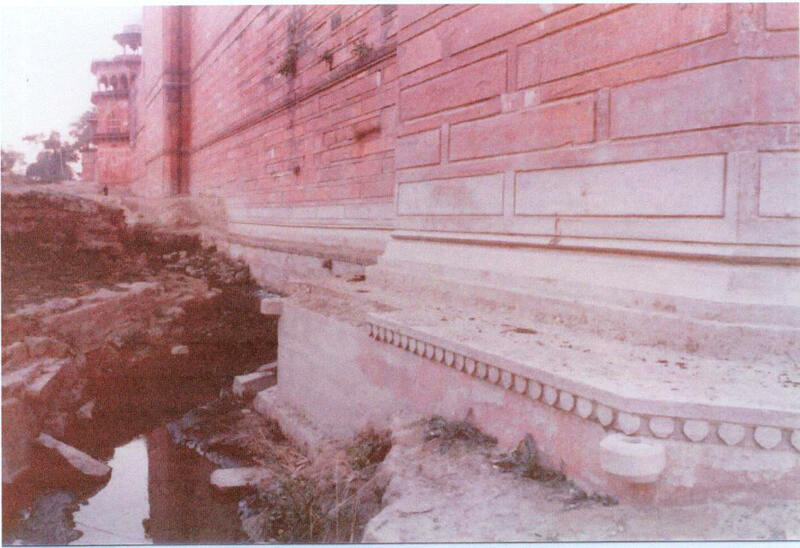 After this revelation, the Government of India removed the timber doors and the openings were bricked up, as shown in the previous photo. 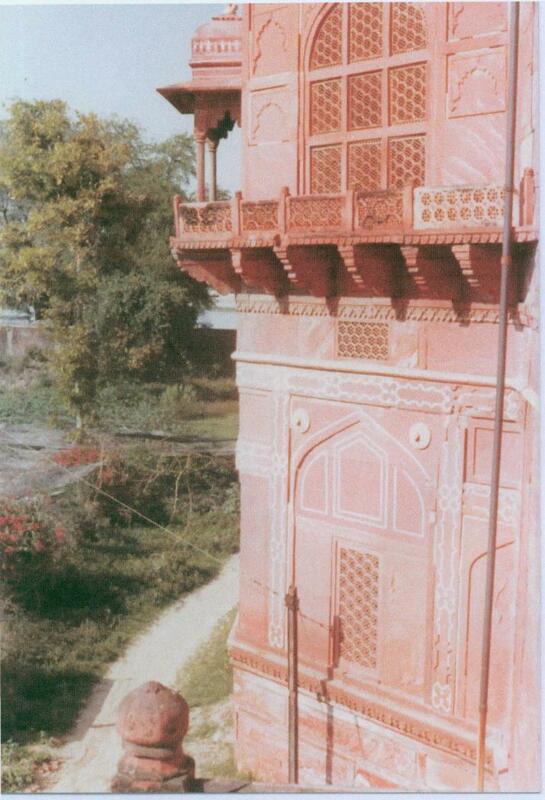 Here is a typical tower (Burj) that is in familiar Rajput style, not Islamic in any way. Stones for anchoring boats. On the North side of the Taj Mahal, there is a platform 3 ft 6 inches wide and it runs for the entire length. The platform also has embedded into it several stone rings for anchoring boats. In the photo we can see two such stones, one in the lower right front corner, the other further up the stream. 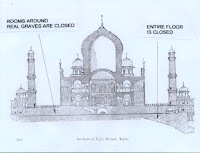 This shows that the building was planned for facilitating boats for river transportation for the residents in the Taj. Again, these are not something you would need for a quiet or even vacant grave site. ALSO NOTE THE DESIGN. Here is a copy of a page of the Badshahnama, the history of Shah Jahan, the so-called builder of the Taj Mahal. This is from the Government of India's National Archives, and available from the instituional libraries dealing with the medieval history of India. This is supposed to have been written by the emperor's chronicler, the Mullah Abdul Hamid Lahori. It describes the site of the Taj Mahal as being full of majestic and lush gardens just south of the city (Agra). It goes on to say that the palace of Raja Mansingh, which was owned by his grandson Raja Jaisingh, was selected as the place for the burial of the queen Mumtaz. This means, of course, that Shah Jahan never built the Taj Mahal but only acquired it from the previous owner, who was Jaisingh. I would like to thank you for this brilliant eye opening article.Everything that you have said is backed by logic,proof both photographic and textual.I have never been to Agra so obviously not seen the Taj Mahal or have pictures infront of it(except maybe one photoshopped by my sister) so it comes as a shock that so many important facts have been ignored for years together even by those who have time and again visited the places. I have also noticed that,it doesnt matter where we go,the Archaeological Survey of India will deliberately brickup a few doors or keep them under lock and key .When questioned,we are told that they are dilapidated structures whereas we can see with our bare eyes that they are in fairly good condition.It's absolutely disgusting!!!! Did Gautama Buddha eat Meat ?? ?